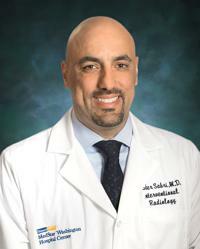 Saher S. Sabri, MD, is the Director of Interventional Radiology at MedStar Washington Hospital Center and Associate Professor of Radiology at MedStar Georgetown University Hospital. He was previously Associate Professor of Radiology and Surgery, Vice Chair of Education, and Residency Program Director for the Department of Radiology and Medical Imaging at the University of Virginia Medical School. He is a fellow of the Society of Interventional Radiology, holds the American Board of Radiology Certificate of Added Qualifications (CAQ) in vascular and interventional radiology, and is a board examiner for the American Board of Radiology. Dr. Sabri graduated from the University of Jordan Faculty of Medicine before completing a residency in diagnostic radiology from the University of Iowa and a fellowship in vascular and interventional radiology from the University of Virginia. He currently serves on various national committees including the Society of Interventional Radiology (SIR), the Accreditation Council for Graduate Medical Education (ACGME), and the American University Radiologists-Association for Program Directors in Radiology (APDR). His service spans international borders with his leadership role in the Pan Arab Interventional Radiology Society (PAIRS). As an interventional radiologist, Dr. Sabri specializes in minimally invasive, image-guided therapy for the treatment of a wide variety of conditions, such as peripheral vascular disease, dialysis access management, aortic aneurysm, portal hypertension, uterine fibroids, and local/regional therapy for liver, kidney, and lung cancer. Dr. Sabri has clinical and research interests in peripheral vascular disease, aortic interventions, portal hypertension interventions, and loco-regional cancer therapy. In particular, he has expertise in advanced limb salvage procedures, balloon-occluded retrograde transvenous obliteration (BRTO) for gastric varices management, lung and liver tumor ablation, and prostate artery embolization for prostatic hypertrophy. Dr. Sabri has been awarded on numerous occasions for his work in the field of radiology including the Vascular Career Advancement Award from the Vascular Interventional Advances (VIVA) meeting and Leipzig Interventional Course (LINC) and the Dean’s Award for Clinical Excellence and the Charles J. Tegtmeyer award of clinical excellence at the School of Medicine at the University of Virginia. He is widely published and regularly lectures both nationally and internationally. Dr. Sabri is an advocate for providing more patients in the Washington, DC area with vascular limb salvage procedures in addition to local regional cancer therapy.